"Make it about something bigger than yourself…" Sony Pictures has debuted the second official trailer for Ang Lee's adaptation of Billy Lynn's Long Halftime Walk, an emotional look at the Iraq war as seen through the eyes of a soldier being honored during halftime at a football game. The first teaser trailer was impressive, and this new trailer hints at even more potential for Ang Lee's 3D 120FPS drama about the emotional toll of war. 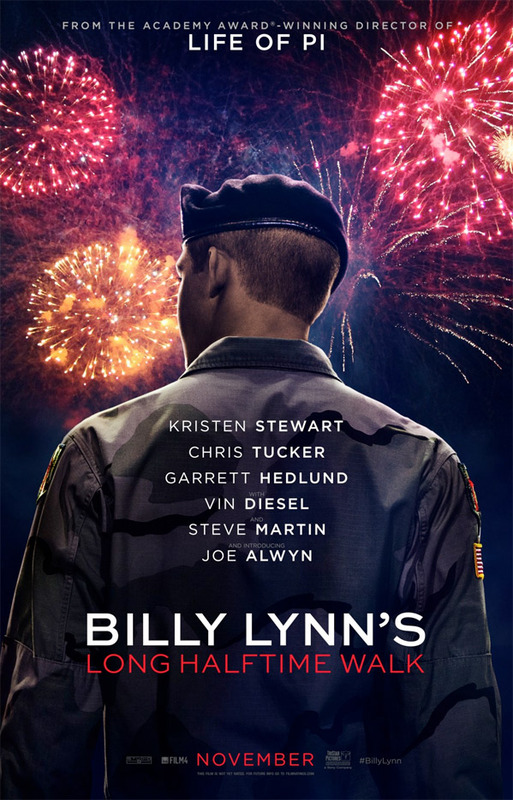 Joe Alwyn stars as Billy Lynn, and the cast includes Kristen Stewart, Vin Diesel, Garrett Hedlund, Steve Martin, Chris Tucker and many others. The film premiered at the New York Film Festival earlier this month to mixed reviews, most criticizing the HFR. This is quite an intense trailer. You can still watch the first teaser trailer for Billy Lynn's Long Halftime Walk here, to compare the footage. What a weird looking movie. My sentiments exactly, and I'm not sure it's just the 120FPS. I like the ambivalence of the trailer. Not really sure how it will play out, but I am interested. Still not sure where Ang Li is going with this. Personally I'm bit tired of patriotic war dramas, but the small buzz is keeping me intrigued.